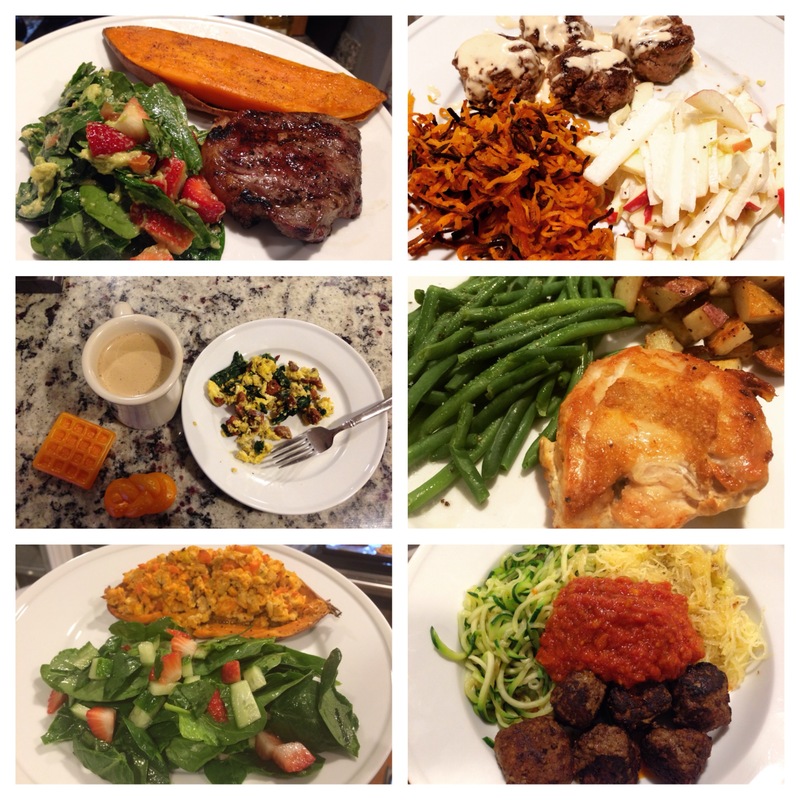 My husband and I completed our first Whole30 on January 30 and stuck to it through to the end with no cheats. I documented the experience on Instagram and Facebook by posting a photo and a few reflective observations at the end of each day. I didn’t set out to post these daily photo updates, but as I posted I found great support from my friends on Facebook and the larger Whole30 community on Instagram, so I kept posting and appreciated the accountability of a daily check in with people who cared. I attribute a large part of our success to this online community so thank you all who cheered us on. Many of my friends had some questions about our Whole30 challenge so to recap the month I decided to write up a two-part Q and A, today’s part 1 will discuss some basics and tomorrow’s part 2 will detail the method to my meal-planning madness! If you have a question that isn’t covered here feel free to ask — we are happy to answer! Q. Why did you do the Whole30? You can read all the though love here. There is more but this is the first point and the one that stuck with me. Probably because I just birthed three babies. And that last pregnancy and delivery was a doozy. I mean it was hard. REALLY HARD. I’m talking the epidural wore off and I felt every last bit of birthing my 8 lb 11 oz bouncing baby boy with pitocin cranked up to maximum strength, hard. I think that pregnancy prepared me for the mental resolve I needed to do this challenge and stick with it to the end. Not to mention, when you are pregnant you give up and/or scale back on lots of things “for a season” because its good for you and your baby. So not only was I fresh off one of the hardest physical experiences of my life, I was also used to the whole giving up foods and drinks for pregnancy purposes. I think this helped me put on my game face with no excuses. Q. Doesn’t Whole30 focus on organic, grass-fed, locally sourced food? Isn’t that EXPENSIVE??? A. YES. Save up and prepare to pinch your pennies. Stocking your pantry with things you have never heard of (like Coconut Aminos, which, by the way, taste like soy sauce) adds up fast. But you also are NOT buying things you normally would so it does even out a bit. We try to stick to the dirty dozen for organic produce and we have already been eating organic meat, eggs and milk. We are SO BLESSED to live a few miles away from the GREATEST GROCERY STORE IN THE USA — Wegmans. They have the BEST PRICES on organic. They match or beat Costco and Walmart (especially on shelf items). People think its expensive because they get caught up in the prepared foods section — that can add up — but if you shop smart you will get the highest quality for the lowest cost. I really should work for them. I love it there. Its crowded and crazy but its my oasis and the only place I frequent with regularity. A. The Whole30 crowd talks lovingly of “tiger blood” basically the euphoric/energetic/powerful/etc feeling that comes with eating healthy. Did I feel tiger blood? I think so, as much as a worn out sleep deprived mom can feel tiger blood. I definitely roared a little more than I should have going through the first two weeks of detox but I don’t think thats what they are referring to with the whole tiger blood thing 🙂 I do notice a difference in my skin and my energy level. I do feel more focus and clarity of mind. In terms of anxiety I have a pretty sound sense of well-being. And despite not getting a full night’s sleep, I do feel more rested with what I am getting than I did before. I did experience my tiger blood a little later than the average person would according to the timeline I started really feeling a difference around day 21. Q. Did you lose weight???? A. Burying the lead here I know, I know. But YES I did. Whole30 discourages weighing until the end, so I followed their lead and I did not step on a scale one time during the month. Today I weighed and I have lost 9 lbs, 3.5 inches off my waist and 1.5 inches off my hips. This is STRONG motivation for me to keep going. I have a goal to lose 30 pounds by April 30 (my 10 year wedding anniversary) and a longer term goal to lose 20 more lbs by my 20 year High School reunion this fall. Q. Where did you find your recipes? Q. Yeah, about those three babies… how did you do this with three babies? A. It’s true, the Whole30 takes a great deal of planning and alot of extra work. But I knew this going into it. In fact, we attempted to do the Whole30 in November but I hadn’t done the planning and prep work needed so we postponed until I could get my act together. So I spent several weeks reading, gathering recipes, planning and preparing to radically change the way I do everything in relationship to meal planning, cooking and eating. Then I worked the plan. I took time when my husband was home to do prep work and get ahead as much as I could. And he is a great partner in crime (he cleans — EVERYTHING!) So having a partner helped tremendously. I do have more to share on the how-to behind my Whole30 and my next blog post will detail the method to my meal-planning madness!